The Old Barn Labyrinth was birthed during April and May, 2011. It was a long but fruitful labor of love, planned during the winter and executed by me, with the strong arms and capable minds of three young men, Dave Steves, Steven Johnson and Liam Honeck. Paths are outlined with rocks from the pre-Civil War barn foundation on the property. Mulch makes a soft walking surface. The Old Barn Labyrinth is located on the east side of the Calm in the Chaos Interfaith Center, and was planned for community participation. After we birthed it, the questions were - Who will come to bring it alive? Who will add a visual, a sound? Whose footprint will be invisible? Who will linger for grief healing? Who will stop by out of curiosity? Poets, celebrants, novelists, pastors, people living with cancer, journalists, feng shui practictioners, intuitive healers, herbalists, wedding parties, gem healers, church groups, sculptors, seekers of the Light, individuals, retreat groups, garden clubs, college field trips, painters … over the years I have made many new friends because of the labyrinth. It costs nothing to walk. And may yield powerful results in your life. Pull your car right onto the lawn adjacent to the road, and begin your walking journey, spiraling inwards towards yourself. For a group visit, please reserve a time. If you need lavatory facilities, want to serve food for an event, or use the barn gathering room, I will happily customize a visit for you and your group. There is less and less quiet and virtually no silence left in our culture. Many worldwide cultures maintain a time during the day for quiet reflection and meditation. I believe we should adopt that practice. Meditation, solace, inner peace, physical healing, emotional healing, clarity… these are only a few of the reasons people walk a labyrinth. A labyrinth is not a maze. Mazes are intended to provide puzzling choices to the participants, perhaps even giving the walker an amount of angst as walkers solve the puzzle and find their way out. Labyrinths are prescribed paths that give structure to your walk, while allowing your mind and spirit the freedom to open widely and settle on nothing at all or to work on a private problem. There are many types and designs of labyrinths. There are table labs, or finger labs. There are portable labs, painted on large canvas or plastic sheets; there are permanent labs, constructed of stone, brick, plants and other organic matter. Whenever a labyrinth enters your life, please accept its appearance and make use of it. 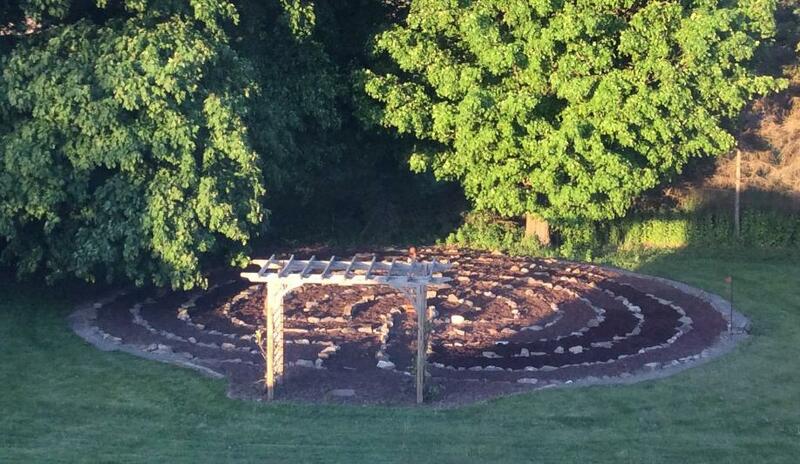 To maintain the sanctity of the space, we at Calm in the Chaos Interfaith Center walk the labyrinth in silence. Mark your calendar now for May 4, 2019. We will be walking at 1:00 pm Help yourself to the craft supplies in the barn to decorate a Prayer Flag, enjoy refreshments, and meet like-minded people who are sending peaceful vibrations into our world.